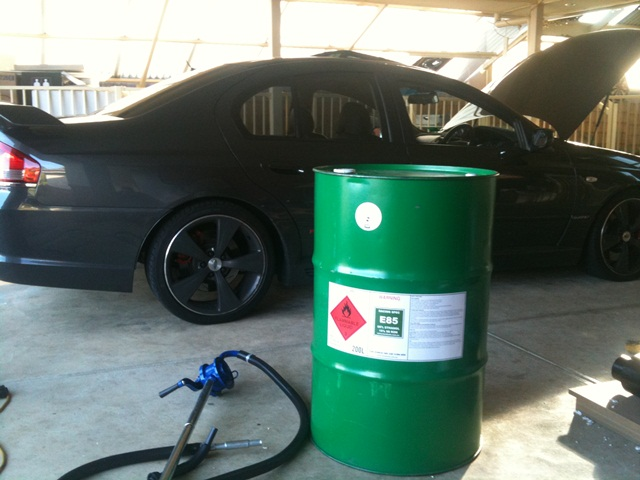 Hey guys anyone know where I can get E85 around the city or any place near the CBD? Does e 85 give more power instantly? E85 uses approximately 35% more fuel for the same bang as 98RON pump fuel, you will need most likely bigger injectors and a retune, do not run it without a tune or you will do damage. Depending on where you buy it from it can get up to 2.50 a litre for Sucrogen. Why would you run a 50% mix for the street Bosco? 50/ 50 mix is easier to start cold. because you need to inject more per cycle than 98ron, the standard injectors will not flow enough on wot before leaning out. most guys run seimens 60lb or similar spec so will not flow enough for 100% ethanol. is p100 still avaliable I thought that was gone? at 100% e85 in boscos car would u say a single 044 with a lift pump be enough martin? wouldnt it more than likely need another 044? I think that's why 50/50 may of been used ? 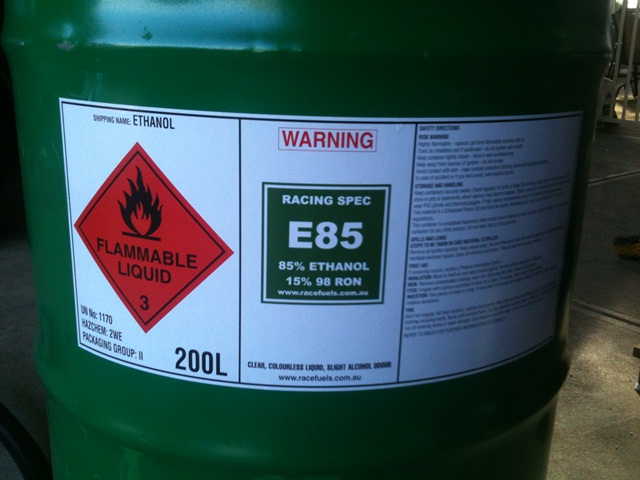 so when you mix 50% E85 with PULP98 (or say a 20litre E85 + remainder PULP98) what sort of octane do you end up with? I mix 20 liters of E85 to half a tank of 98. Anyone bought a 200ltr drum of E85? Cost effective? This is the barrel I got through Elf Racing Fuels....was expensive but you get what you pay for....Smells and looks like you could drink it with a few rocks in it :sungum: Think im doen to about 60 odd litres left. I reckon ill look into getting a drum. I use a 50/50 mix too so although that the good stuff is double the price my car only gets driven on the weekends so it should last a while. My old man sells VP race fuels so I might see if they have a e85 on the market and if they do I'll get a price. I dont live close to an outlet, so take 6 or 7 jerrycans and fill up. then do the mix at the 98 ron bowser. United at pooraka have E85 now so it only a 5 min drive weee :D go buy a barrel n got to the united n fill it up that's what I would do!